Homepage. This page: The official magazine for a car and motorcycle enthusiasts' club in Leeds, 1928. 1928 Leeds Motor Club magazine. At the time of writing, this is by far the oldest motor club magazine to feature on the site, dating as it does to the 1920s. This is only the fourth ever issue of Rightaway, "the official organ of the Leeds Motor Club", dated July 1st 1928. Curiously within the magazine, it states that this is issue three rather than four. The club's badge incorporates the city's coat of arms, along with its motto Pro Rege et Lege ("For King and the law"), surrounded by a pair of winged wheels. Below it are illustrations by "Holloway" of a racing motorcyclist, and a chap at speed in his sporting motor-car. The price of this vintage-era magazine was 6d. The magazine contains not only a good number of articles, but also a plethora of fascinating advertisements of the time. The rear cover features a belter for A.I. Greenwood Limited, a Matchless motorcycles agency located at 39 and 41 Guildford Street in Leeds. The machines featured are a 4.95hp Two-Port Super Sports Solo (V/2), for which a price of £57 15s 0d was charged, and a 3.47hp T/S Sports Solo - price £48 15s 0d. 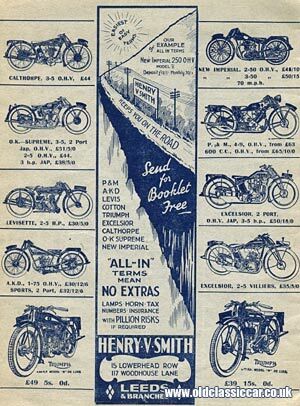 They also supplied AJS, Royal Enfield, Humber and Zenith motorcycles. 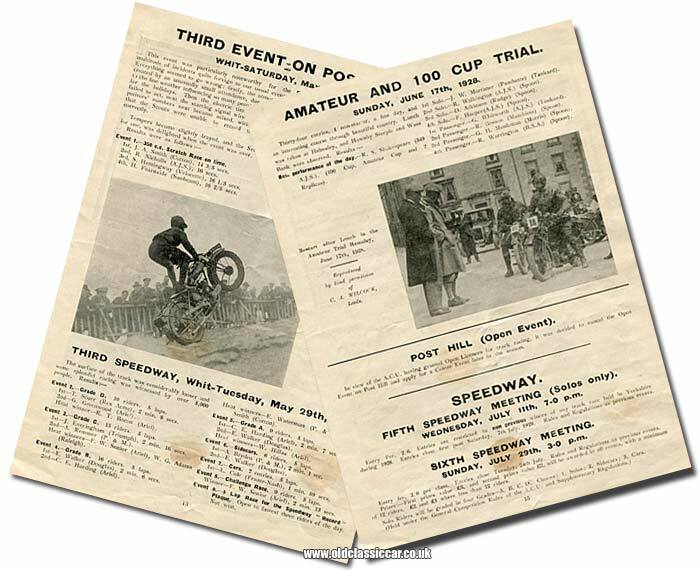 Despite being a motor club for two- and four-wheel vehicle enthusiasts, the majority of the magazine's content relates to motorcycle competition. The content begins with correspondence regarding matters to do with the ACU (Auto-Cycle Union), and an ongoing dispute with the Northern Centres with regard to the latter being (in the clubs' view) insufficiently represented at ACU level, and authorisation (or the lack of) by the latter of track meetings held by affiliated motor clubs. Judging by correspondence sent to the editor by a number of members, the warring parties had some way to go before peace could return to their dealings. Of more interest though are the write-ups relating to past and upcoming club meetings. Road runs out to local attractions seem to figure regularly in their list of summer activities, with motorcycling members taking advantage of organised jaunts over to Horton-in-Ribblesdale, and also Marske - the latter "... a delightful day spent lying in the sun and playing games on the sands". Later in the month there were plans in place for a trip to Lofthouse, with a tour of the nearby underground caverns pencilled in - bring "some form of lighting", members were advised. The centre spread is given over to competitive meetings, and reviews of past events. This month, July, would see three speedway gatherings, and an off-road trial at Post Hill. The hill was so-called because, in 1925, the club had been looking for a hill to use in trials. It was purchased for the club by the Yorkshire Evening Post. As a result, the hill was named Post Hill, the first trial taking place the following year, 1926. A Consistency Reliability Trial would also be held at Post Hill, on the 22nd July. A write-up of the Whit weekend Post Hill meet describes the trials and tribulations that any event organiser might have to deal with. Not only were attendance levels unusually low (thanks in part to the fine weather causing people to head off to the seaside), but the electric timing apparatus packed up, the starting signal wire expired, and the competitors' entry numbers were somehow mixed up, leading to the Scouts - who it seems were in charge of recording the results of the climbs - struggling to make sense of proceedings. A fraught day. Machines from the likes of AJS, Cotton, Velocette, Sunbeam and Rudge featured strongly in the days' five separate events. A photograph of G.H. Overend - perhaps an unfortunate name for someone tackling a steep climb on a muddy trials hill - battling his way heavenwards on a Triumph at Post Hill in May, accompanies the article. Regulations for competitors taking part at Post Hill were explained on page 16 of the magazine. These included requirements for all competing machines to be road-legal, although silencers were optional (try getting away with that now). Mudguards had to be in place, with "efficient" brakes at both wheels. Crash helmets were compulsory - interesting, as many car events at that time, and for many years afterwards, did not demand that drivers had to wear a bone-dome. Those with an interest in motorcycle tours, ie rides out without a competition element to them, were equally well catered for, judging by how many road runs were planned for July alone. 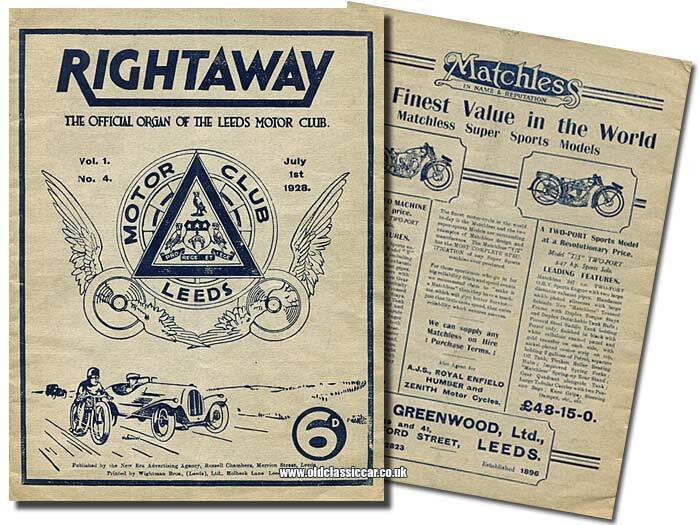 I wonder if Leeds Motor Club was formed in 1928, at the time of the first issue of Rightaway, or whether the club had been in existence for some time before issue number one was printed? For a local motor club, it was very well supported by local car and motorcycle businesses. Adverts for all manner of related firms can be found in this publication, the following are some of my favourites. Henry V. Smith. motorcycle dealer. Although car-related items in this magazine are definitely in the minority, there are some little gems lurking within that relate to vintage cars. 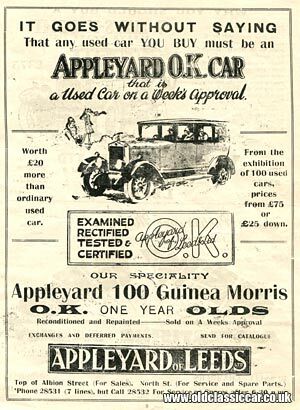 An example is this full-page advert for Appleyard of Leeds, a dealer in Morris motor-cars. The firm offered used cars - "Appleyard OK Cars" - on a week's approval. All their "100 Guinea Morris" cars had been checked over by the firm's own staff. Despite being just one-year-old machines, they were reconditioned as required and - it says - also repainted, although it seems unlikely that every example would need a full repaint after only a year or so of service. The illustration features a flat-nose Morris saloon, driving along with a chap and his family enclosed within the Cowley-built car's boxy coachwork. The flat-nose cars, Oxfords and Cowleys, were introduced in 1926 and still current at the time of this magazine's publication, 1928. Two Appleyard premises are mentioned - one on Albion Street (for car sales), the other on North Street (for servicing and the purchase of spare parts). Inside the rear cover, is an advertisement for a Thomas Appleyard Limited, situated on New York Road. Rather than Morris cars, this firm dealt in Studebaker, Erskine, Clyno, Jowett and Singer cars. Willys-Knight Sleeve Valve Six £375. Firstly - the engine. Close your eyes - and for all you can hear or feel - you might not be moving ... though the speedometer says "45". Never a sound or vibration from the wonderful sleeve-valve engine. 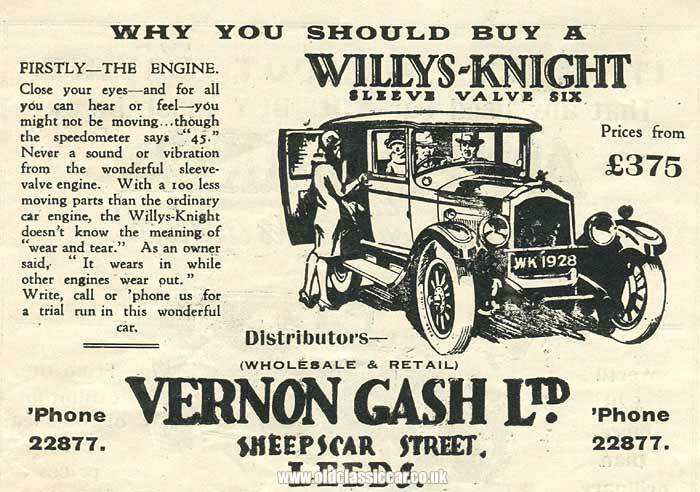 With a 100 less moving parts than the ordinary car engine, the Willys-Knight doesn't know the meaning of "wear and tear". As an owner said, "It wears in while other engines wear out." There are plenty of advertisements for firms and individuals offering support services to owners and drivers of cars and motorcycles. One of the more eye-catching is for W. Adams, motor engineer, located on Stoney Rock Lane in Leeds. 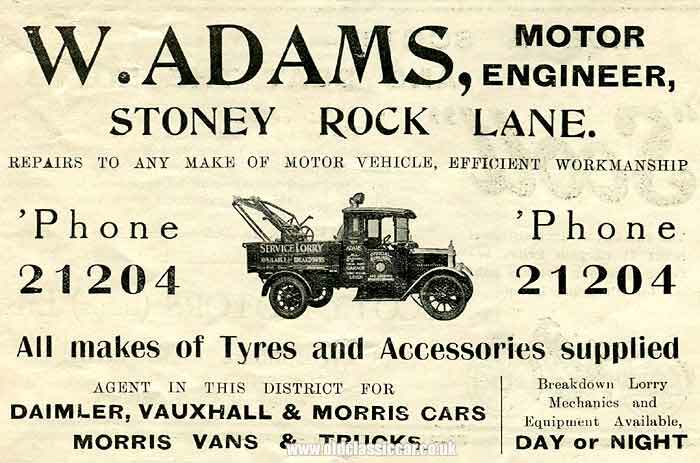 In addition to being a dealer of Daimler, Vauxhall and Morris cars, Adams could also supply Morris vans and lorries. A fine breakdown truck, fully signwritten with the company's details, stars in their half-page advert. What became of the Leeds Motor Club? Evidently it was formed in the 1920s, and had a thriving calendar of road and track events. But when did it continue until? I've seen mention of the club surviving into the 1980s, but what happened next? I can find plenty of modern-day references to a "West Leeds Motor Club", an organization still active and formed following WW2, but as far as a I can tell, not a direct relation to this 1920s group. A Leeds history website suggests that by 1930, the club's HQ was at 188a Woodhouse Lane, outside of which were stationed a number of petrol pumps. If more information on the club, or copies of Rightaway magazine turn up, I'll update this page accordingly.